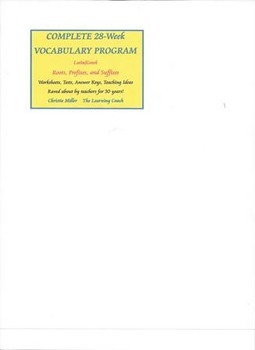 A YEAR LONG Vocabulary program based upon Latin and Greek Roots, Prefixes and Suffixes. Everything you need from THE LEARNING COACH, Christie Miller! 28 lessons, printable worksheets, tests, review finals, and the answer keys. I have been using this program for over 30 years of teaching and have shared it with many other teachers who RAVE about it. Students learn one root and many prefixes and suffixes each week. Then they are tested on each lesson. Each test builds from the last test, so each test has review from the weeks before. Ideas are also included to present this important part of the English curriculum. NOTE - This a 130 pages for you to use all year! !